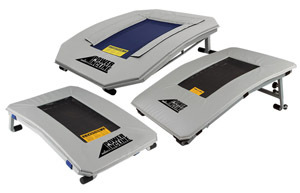 Norbert's Power Incline’s lower approach height and longer take-off zone offer a more accessible target than square, octagonal or round beds without sacrificing the superb lift and minimal resistance of a standard mini tramp. Power Incline frames are fabricated of heavy-gauge steel tubing with all joints welded for years of rigorous use. All are equipped with polypropylene beds and pads which fully cover both frame and springs. Our scaled down Junior Power Incline provides greater lift to smaller gymnasts. With the addition of our revolutionary new Power Incline 2.0 with its advanced design features, there are now three models from which to choose. All Power Inclines meet USA Gymnastics vaulting device specifications for JO Level 1 and 2, and XCEL Bronze, Silver and Gold Divisions.